Home » News » Policy Dialogue: EU Enlargement and the Berlin Process: What Role for Civil Society? 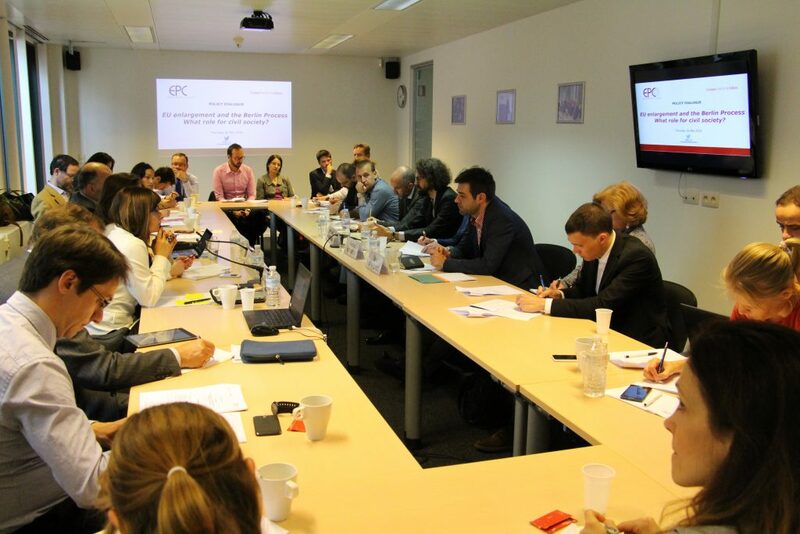 Policy Dialogue: EU Enlargement and the Berlin Process: What Role for Civil Society? The European Policy Centre in cooperation with the European Fund for the Balkans organised the policy dialogue “EU Enlargement and the Berlin Process: What Role for Civil Society?” on Thursday, May 26th, 2016. Andris Kesteris, Principal Advisor from Civil Society and Media in DG NEAR, Niccolo Milanese, Chairperson of European Alternatives, Daliborka Uljarević, Executive Director of Centre for Civil Education, Montenegro will take part in this public debate. Dane Taleski, Visiting Fellow from Centre for Southeast European Studies at Graz University and Igor Bandović, Senior Programme Manager of European Fund for the Balkans, Serbia will also participate in the dialogue on behalf of Balkans in Europe Policy Advisory Group and European Fund for the Balkans. Corina Stratulat, Senior Policy Analyst from European Policy Centre moderated the debate, that was held at the EPC Auditorium, Brussels. At the Western Balkans Summit in Vienna last year, the representatives of civil society organisations (CSOs) from the Balkans were, for the first time, given the opportunity to get involved in the Berlin process by presenting policy recommendations. Follow-up initiatives, including the Regional Cooperation Day in December 2015 and this month’s Civil Society Forum Belgrade, sought to strengthen the capacity of civil society actors in anticipation of the upcoming Western Balkans Paris Summit this July, where CSOs will be able to make their voice heard in the framework of the Civil Society Forum hosted by the Paris conference. Proper coordination and preparation of civil society actors’ positions on subjects such as youth cooperation, the migration crisis, the resolution of bilateral disputes and environment/climate change, will be essential if the civil society sector is to be taken seriously and be able to influence the agenda and outcome of the Paris Summit.